D Pentatonic: D1 to E2, Size: 30 x 20 x 4 cm. My Little Lyre is meant to be a simple but powerful tool, with which, through games, playing together and listening, the child can learn music in its fullest meaning. The aim has been to create a lyre with a clear and light-filled sound, carried by the material's own tone quality. 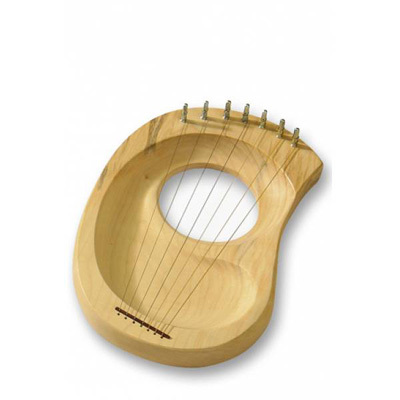 To achieve this the strings are brought into balance with the static resistance of the shaped wood, which is needed so that the whole body of the lyre will be penetrated and resound with the tone's movement. In this living process the ”voice” of the instrument has its origin. ‘My Little Lyre’ is made out of maple wood. The instrument is made to be held in the left hand; the recess on the back guides the hand and thumb to a good hold. The left hand grip gives the player freedom to dance and to move the lyre to the music. It also makes it possible to practise finger and chord playing. For two handed playing the lyre can be laid across the knees. If you want to have some rhythmical fun with the instrument, let a paper strip be woven through the strings, hold it in both hands and play it like an African thumb piano.